In the fall of 2007, shortly after arriving at MIT, I began designing an ultra lightweight and compact electric scooter that used a motor embedded in the wheel (a hub motor) – a project which became the original RazEr. Hub motors are nothing new and have been used on bicycles very extensively and some experimental cars and motorcycles, but nothing smaller. 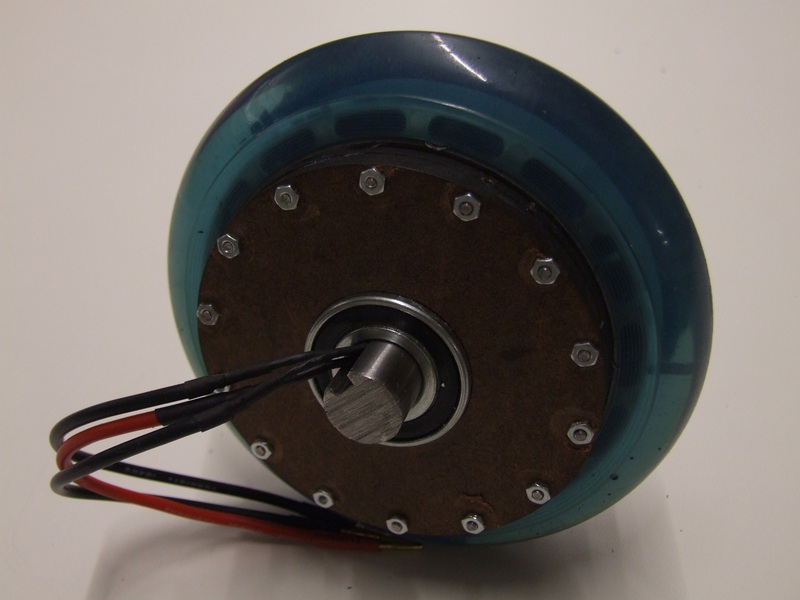 Possibly due in part to the belief that such small motors can never generate enough torque to move a person, there has been no commercial product that fills the 6 inch wheel and smaller range. However, I have found otherwise – that permanent magnet brushless motors can be made both very small and very powerful, and the ability to hide an entire drivetrain inside the wheel opens up a world of personal transport solutions that has not been explored before. The motors listed below are ones that have been built and run either in vehicles or in testing. 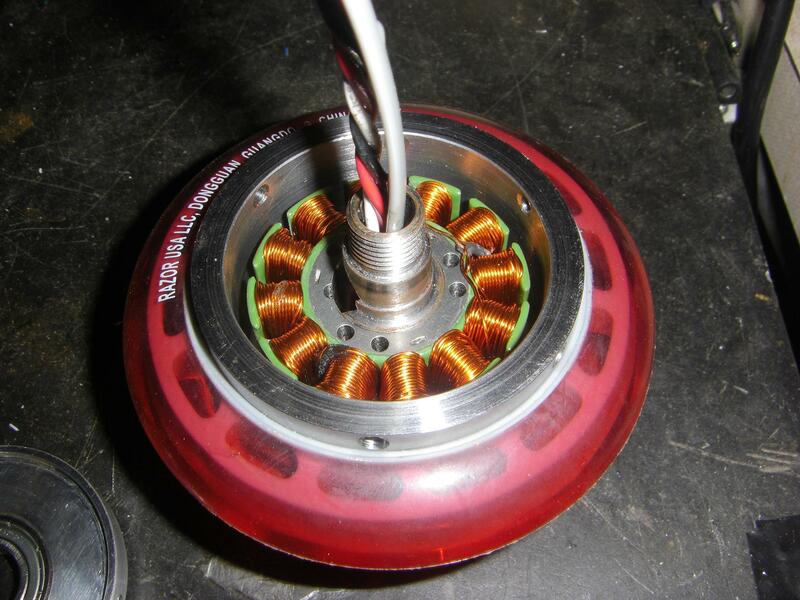 The original RazErmotor was my first stumbling step in the world of building permanent magnet brushless motors, and while it was a functional failure, much was learned about motor physics and magnetic properties of materials. 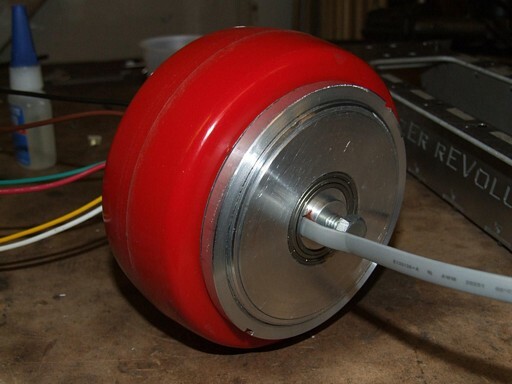 The motor used a custom waterjet-cut, coarsely laminated stator made of mild steel, which was a total disaster. It was an integer-pole motor, since at the time I had not yet learned about fractional-slot motors yet, and had high cogging torque as a result. However, this proved to me that I could fit a motor inside a 125mm scooter wheel, and immediately led to the functional and better-constructed RazErmotor 2. The original build reports for Razermotor 1 can be seen in the “Snuffles Reloaded” / Project RazEr build archive, some of which may have broken pictures due to the posts being from before I switched servers several times. The second RazErmotor was the first to see repeated use in a vehicle, specifically RazEr itself. It was built using a much wider stator and larger magnets, and is the first motor I built that is a fractional-slot type motor which has minimal cogging. 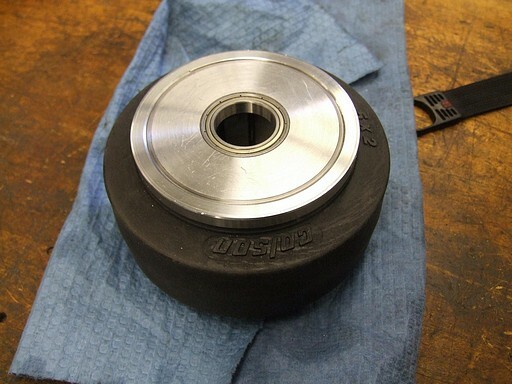 The rotor was 3-piece, with the wheel sandwiched between 2 endplates and otherwise surrounding the magnet ring. 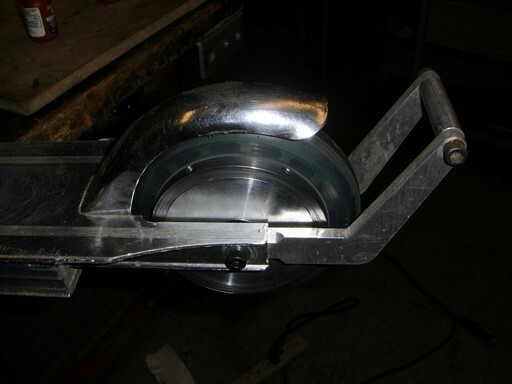 This design proved to be weak because the wheel would repeatedly bend the case screws as it rolled, eventually causing stripping and shearing of the screws. 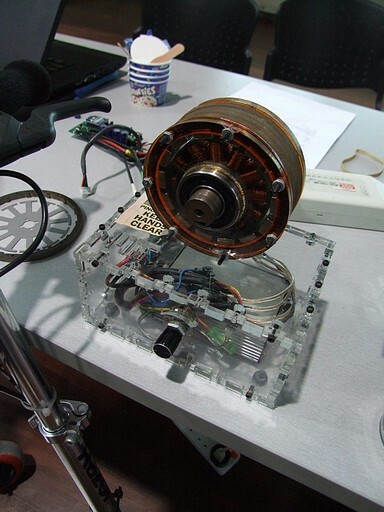 The motor case was rebuilt and the stator reused for RazErmotor 3. After the destruction of the 2nd RazErmotor, I reused the stator and windings and rebuilt the rotor. The new rotor is the first to deliberately feature a removable wheel, and pioneered the “radial case screws and threaded locking ring” that I have come to favor. Otherwise, the electrical specifications remained the same. RazErmotor 3 actually had a second “version” that featured a rebuilt stator after the RazErmotor 2 stator overheated and burned up. However, the “3.1″ version had substantially less torque due to a thinner stator. Breaking from the requirement that my motor somehow fit into a small Razor scooter frame, I decided to start completely from scratch and design a scooter around a motor. The result was RazEr rEVolution, which was much bigger, faster, and could carry more battery than the original RazEr. This motor used a 125mm, 2 inch wide industrial caster as its tire, which actually turned out to be too hard to be useful. The stator was expanded to a massive 40mm wide with 2″ long, 1/2″ wide block magnets. To mitigate having to run the motor at 72+ volts for it to be useful, I used a “parallel” style winding in which the standard fractional slot winding was split into two interleaved windings which functioned magnetically the same, but cut the motor resistance (and torque constant) in half. Despite seemingly being a loss, the final torque constant of the motor ended up in a practical range for 36 volt operation. How small can these things go? With the RazErBlades project, I was aiming to find out if you could make an even smaller hub motor. It turns out you can, but unlike RazEr’s motor, one is probably not enough to move a person around. With each linear dimension loss (stator radius and stator length), the torque constant decreases nonlinearly as the length of copper wire in the windings is progressively lost (and multipled by the number of turns). To gain it back, more turns must be used, but that increases the resistance of the motor, leading to less efficiency. Thus, the skatemotors are definitely not the most efficient things in the world, but for a low powered application such as the RazErblades, 4 of them turned out to be more than adequate as propulsion, and possibly just two can act as a glide assist for rider-propelled vehicles. This updated variant of the skatemotor was the first time I had experimented with production parts, in the interest of maybe selling them one day. I had 12 sets of motor parts machined by a Chinese job shop, hired over mfg.com. What to do with 12 motors’ worth of parts? Start building vehicles to use them, of course. First is Chibikart, where I was thoroughly surprised at the performance of these motors if they had a little more optimization put into them than the original skatemotors. 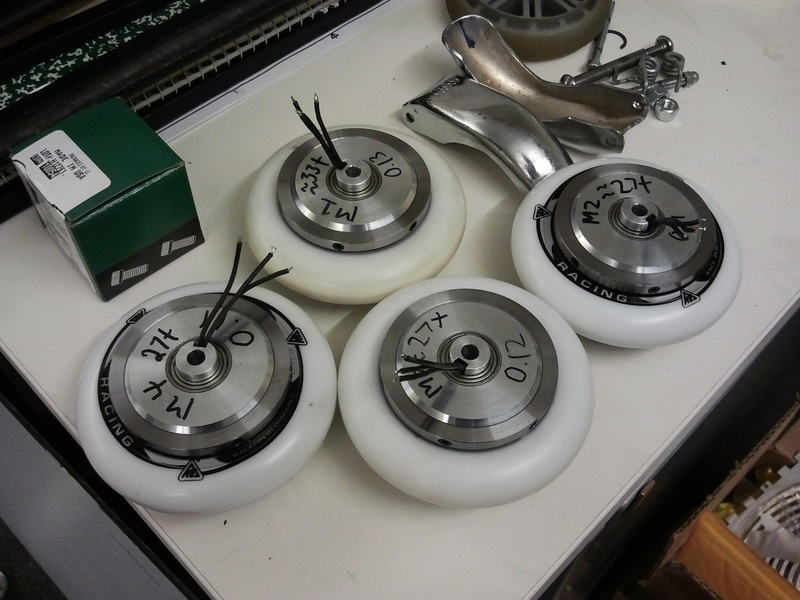 Difference between these and the first generation skatemotors include slightly wider can and deeper-dished endcaps to accomodate more windings (or n00b windings in the future potential product) and an easier-to-manufacture shaft design that essentially consisted of a straight shaft with retaining ring grooves. Kitmotter! 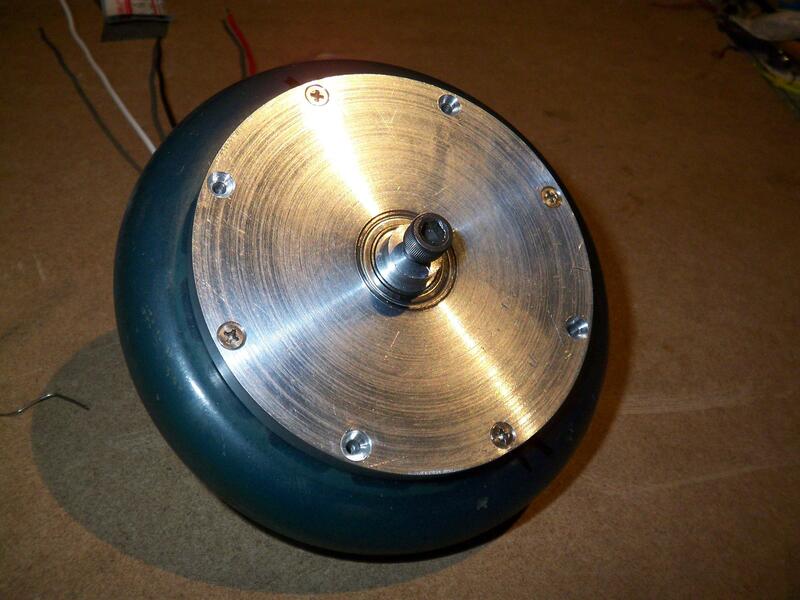 is a motor that can be built without access to expensive computer controlled machining equipment. Developed based on designs initially built by Shane and Jed, the concept is to form the magnet rotor using waterjet- or laser-cut steel rings and end plates to avoid machining. The shaft is a stock section of keyed shafting available from industrial suppliers like McMaster-Carr or even hardware stores. 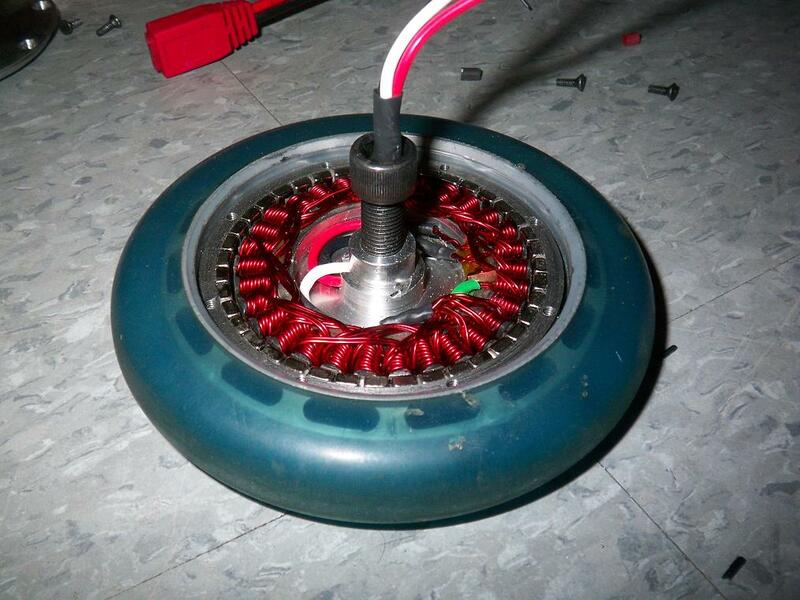 The stator is salvaged from a copier motor, and the stator hub can be 3d-printed. Waterjet-cutting and 3d-printing are now services which are available to anyone with a design over the internet at vendors such as Big Blue Saw, Shapeways, Pololu, and others. Note that the version of Kitmotor that has been built used an integrated machined shaft, since I was more interested in testing out the waterjet-cut rotor rings. Recently, the display case (and Kitmotter itself) was repackaged after suffering some damage. It now works again. The only thing missing from Kitmotor is finding a suitable wheel or method of attaching to it. The shortcut solution is “BWD Style” using thick rubber adhered to the outside, but it would be better if I can actually find a wheel to bolt to. Kitmotter 0002 has officially solved this problem! Kitmotor has a short build thread of its own. Besides the originators, active laminated plate styled designs are found on Amy’s Picofahrrad and Jamison’s Razor Wind. Kitmotter 0002 was made to finally take care of the details that had been hand-waved and left out of the previous design: how to mount a wheel onto it, as well as how to secure the stator to the shaft. I happened upon a (now very obvious-seeming) solution of using a hole saw to core out a standard 5″ diameter scooter wheel, and there is some hope for the same technique working for 4″ scooter wheels too. The motor is now 100% buildable without machine tools – the endcaps are laser-cut and the rotor stack itself is waterjet-cut (both hired out to Big Blue Saw), the stator hub is a 3D printed nylon piece (hired out to Shapeways), and the stator itself is harvested from a HP laser printer motor (see my copier motors collection here). All other parts are stock components from the magnets to the shaft itself. With a full motor plus wheel completed, I decided to mount it on a vehicle and ride it. The 3D printed hub turned out to be a bad idea – nylon melts at temperatures that harm neither winding nor magnets. The revised hub is made of the same laser-cut hardboard (HDF, masonite) that the endcaps are made of. See Kitmotter’s build thread here. Theme created by miloIIIIVII | WordPress | Entries (RSS) | Comments (RSS) | 30 queries. 0.243 seconds.